When it comes right down to it, there's really only two ways to manage your personal transportation. The first method, which is most common; is to buy a new car, drive it into the ground and then throw it away for a new one every 4 or 5 years. It's easy and there's no work involved. Buy a car, use it up and get a new one. But the second method, holding onto your car, this method requires real work. And that's because when you have a car worth keeping, unless you're an expert mechanic and can do it yourself, then you're going to need help - if you want to keep your current, good quality car running well and safe to drive. 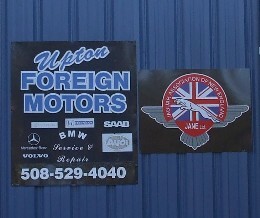 Whether you own a BMW, Mercedes Benz, SAAB, Volvo, Cooper, Jaguar, Lotus, Lexus, Infiniti, Toyota, Honda, Audi, Volkswagen (or Ford, GM or Chrysler) we can help you today. Have you got car troubles? - call us at today (508) 529-4040. When you call, we'll allocate the needed time to determine your requirements and coordinate an affordable service plan which meets your needs - with minimum hassle to you.